We can customize any itinerary just for your group. For more details about group travel with Brian Moore, click on the questions below or call us at 800-290-6686. Can we stay in a Castle or Villa? What will our coach be like? How many do I need for a group? Can we do a Family Group? What’s included in your programs? Can you provide air from my city? Could I be subject to baggage charges? How experienced are your Tour Directors? Can we combine countries on our tour? I would like a special itinerary for my group? Do you offer Tour Conductor places and Free Places? There’s never a bad time to go. The most affordable time is between November and March when the airfares are lower and it’s less crowded. In summer the airfares go up, but you get much longer days with daylight until 10.00 pm in June and July. The itineraries outlined in this planner offer a wide variety of locations and attractions. We always use centrally located hotels in cities and towns and mostly 2-night stays. This offers a leisurely pace and your group is not packing and unpacking every single day. We usually include dinner on the first night, leaving the second evening free for people to do a little exploring on their own. Because we are downtown, there is always an abundance of restaurants and pubs within walking distance of your hotel. All entrance fees, taxes, tips (except the gratuity to your Tour Director) are always included. Many of our programs include a Castle or Villa stay which is always a highlight for any group. Of course we can add a castle or villa stay to any group itinerary. All of our touring coaches are deluxe, air conditioned vehicles and less than 3 years old. The have a washroom on board and seat 48 people comfortably. All of our escorted programs include 1 free place with 20 paying passengers and 2 free places with 30 paying passengers. For your customized program we can include any number to meet your requirements. 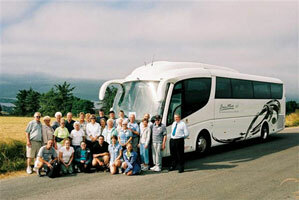 There is no minimum for your group on any of our itineraries. Initially we will offer you at least 15 places, but if you only end up with 6 or 8 passengers, your group will still travel. We are also selling other clients into these departures. Thus there is no risk that your group will cancel. For customized groups, we do require at least 15 paying passengers. We can make all the arrangements for your family on any of the programs in this planner or customize a trip just for you. We can provide air for your group from anywhere in the United States to any European city. We have contracts with all the European and US carriers that service these destinations and our net fares mean you get the best deal. We can also hold group space with your chosen airline and we won’t be changing your flights at the last minute. We started doing groups in 1975, and back then anything over 2 was considered a group. We have over 30 years of experience in selling group travel and you can be assured of excellent service. Some of our groups have traveled with us 15 times and keep coming back each year. Most of our tour directors have been with us for over 20 years, some since our inception 30 years ago. They are one of the most important elements of any group and we only employ locally qualified Tour Directors. The simple answer is yes. Many of our groups combine Scotland & Ireland or London & Paris or Spain & Portugal. You can choose from our itineraries or we’ll customize a trip just for your group. You can have the same tour director throughout or perhaps you’d prefer a local director in each country. If you don’t find what you’re looking for here, we can customize any itinerary just for your group. Each year we plan tours for church groups, golf groups, garden enthusiasts, musical groups, literary groups, pub groups and we can handle any request. Our motto is, “No is not an answer” when it comes to customizing group tours. Let us show you how we can make your trip a lifetime experience. Yes, airline-imposed baggage fees may apply and be due at the airport; please consult your airline prior to departure for the latest fees. Because of changes in restrictions and security concerns, individual carriers on Intra-European flights can have different baggage restrictions than trans-Atlantic carriers. Intra-European flights tend to be more restrictive on baggage weight and luggage size than transatlantic flight guidelines and could result in excess baggage charges. In order to make your flights as pleasant as possible, it is important that you check each carrier's baggage restrictions prior to flying.